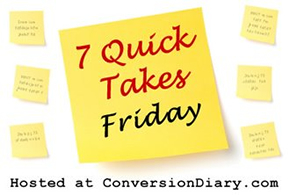 7 Quick Takes — Liturgical New Year, Advent, and Gift Ideas [vol. 11] | Pray. Work. Motherhood. Have you been living under a Catholic rock? If so, no worries. I’m here to be your Geraldo Rivera. Or Walter Cronkite. Or Tom Brokaw. Whatever. BREAKING NEWS! Holy Heroes is once again offering their super awesome Advent Adventure Activity Book! This little guide is a great way for kids to follow along during Advent, and joyfully prepare for the coming of the Savior 🙂 Also, for the first time this year, our family is trying our hand at making our very own beeswax advent candles! You can also sign up for daily Advent activities delivered to your inbox, completely free. Speaking of Liturgical New Year, what better time is there to begin cooking your way through the Church calendar? I remember a homily once on the feast of the Immaculate Conception where the priest exhorted the congregation to expend a little effort in celebrating the special feasts of the church year. “For crying out loud,” he said, “REJOICE! Put some sprinkles in your yogurt or something!” Our family still chuckles about this advice to this day, but the man has a point. My hip, Blessed Mother-tattoo-sportin’ friend Haley and her rugged husband Daniel “Bearman” are working on the sequel to their first liturgical cookbook, FEAST! Their first book has great recipes for many of the special feast days throughout the year, and they even include a few cocktail recipes! I love giving this book as a wedding present to Catholic couples. In anticipation of the sequel and to get you pumped up for the New Year, Haley has promised that OeLeM readers will each have a chance to WIN an e-book version of FEAST! very soon. Be sure to check back in the coming days for details! Psssst! Have you heard? (There’s a rumor in St. Petersburg<—you’ll only get this if you’re a diehard Anastasia fan.) Tickets for Edel ’15 go one sale next week!! In case you need a reminder of how awesome it was and what you missed, be sure to catch up here. We would love for you to join us in Charleston, SC. I’ve never been there, so I am really looking forward to it. Remember Kelly Mantoan of FloRida rap and mic drop fame? She and the incomparable Rachel Balducci are our esteemed speakers for the weekend. Best of all? If for some reason you can’t join us, Sirius XM has agreed to simulcast the whole weekend, LIVE! How insanely cool is that?! Just a reminder that you only have until November 30th to take advantage of Organic Mama’s Shop generous deal! You can take 20% off of ANYTHING in her shop by simply using the coupon code CAJUN at checkout. Rosaries, Rosary bracelets, novena bracelets, decade Rosaries, nursing necklaces, nursing bracelets, earrings – there is literally something for everyone on your list. Get your Christmas shopping done in just a few clicks, before Black Friday! Don’t forget I am on Pinterest and Instagram, and would love to see you in those places on the web, too. May God bless you and your family – have a fabulous weekend! There is so much awesome in this post I don’t know where to begin. Order advent activity books? Check. Get SO excited to order that I didn’t finish reading and missed out on free coloring book with promo? Check. Do a happy dance for future chance to win FEAST book? Check. Laugh until I cry watching Stephen Colbert dance to King of Glory? Check. Drool over rosary bracelets from Organic Mama’s Shop? Check. I am not gonna lie. I had a blast writing this one!! So glad you enjoyed it. Thank you for your order…you will love the activity books! 🙂 Happy Friday! We’ve used Illuminated Ink’s Easter Candle kit (among a million other things of their’s we’ve used): so fun and easy to roll candles!! There is guaranteed to be little to no yelling involved! Promise! And Sirius XM broadcast; equal parts awesome and terrifying. If people can’t see my face and hand gestures, how will they know when I’m joking???? I will have to check that kit out, Kelly!! And I have NO DOUBT you will ROCK that broadcast! 🙂 So excited to hear you speak.